We are taking a short blogging break for the month of July. We will be spending time with our families, recharging our batteries, and, of course, planning a whole slew of new blog posts to share with you at the start of the new school year. Don’t worry, though, we have a lot of resources for you while we’re gone. 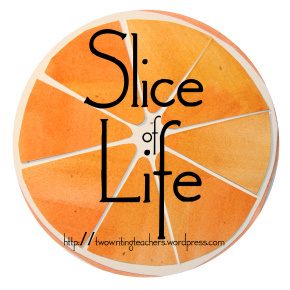 You can find us here every Tuesday for the Slice of Life Story Challenge (SOLSC). Kathleen is hosting for the month of July. If you have never participated, July is the perfect time to try something new. The Slice of Life community is a warm and welcoming writing community, perfect to get your feet wet. Simply write a story from your life on your own blog, and then on Tuesdays, share a link to your story in the comments section on the daily call for SOLSC post. Comment on at least three other posts, and enjoy all the comments that you will receive in return. We will come back in August with our next blog series, Starting with What Matters Most in Writing Workshop. 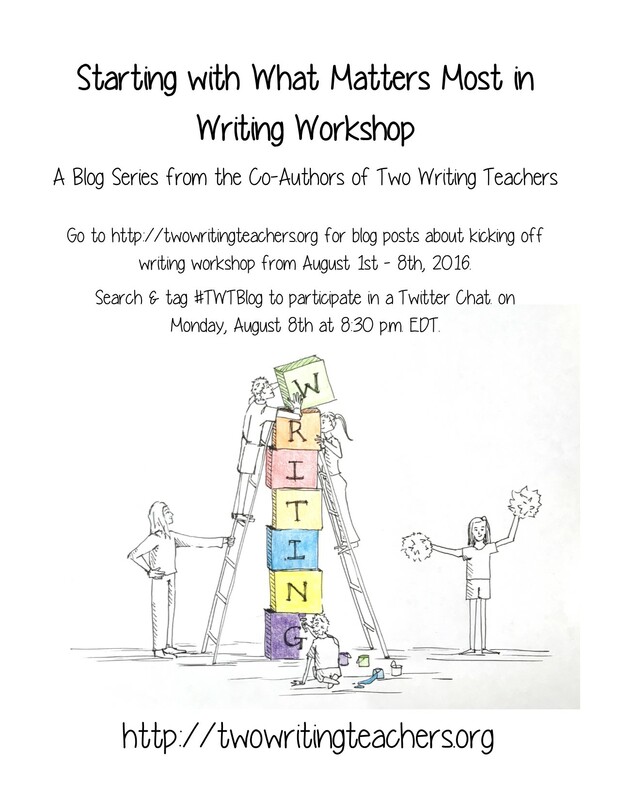 Each of the co-authors will dedicate a post to what matters most in writing workshop. We will cover everything from audience to notebooks to work habits. You can mark your August calendar for our Twitter Chat on Monday, August 8th at 8:30 PM EDT. Use the hashtag #TWTBlog to join the conversation. We recently launched a new “Presentations” page on Two Writing Teachers which lists all the places you can find us out and about. In July you can catch Kathleen at the Long Island Writing Project in New York. You can also catch Stacey at the International Literacy Association Conference in Boston, MA. Finally, Betsy will be at nErDcamp in Parma, MI. We’re on Pinterest! Check it out by clicking here. And, did you know that we’re on Facebook? Click here. We hope you find time in July to relax, to learn, and to spend time with those who matter most to you. We will be back August 1st with our latest blog series! All work and no play makes our TWT hosts exhausted. So enjoy the break and thanks for your TLC all year long. Enjoy the month! All of you deserve this time away, and we’ll look forward to your return in August. Thanks for all your work during the year! Have a great summer break! See you in August! Hope you all have a wonderful, relaxing month! Good for you. Enjoy July – you more than deserve a break.